It’s Tax Day in Iowa, and many thousands of families are benefiting from the newly expanded state Earned Income Tax Credit. Almost unnoticed as Iowans file their state income taxes today is that many thousands of families are benefiting from a newly expanded state Earned Income Tax Credit (EITC). New data from 2012, compiled by the Brookings Institution, sort out by legislative district the number and percentage of tax filers who benefit from the federal EITC, on which the state credit is based. We have put that information into a new Iowa Fiscal Partnership backgrounder; the two-pager is available here. 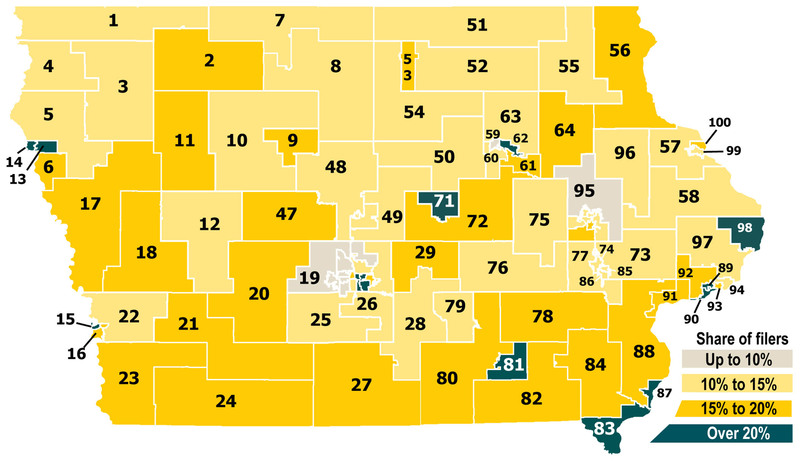 In the map below, the golder and greener the district, the greater its constituents use the EITC. In the green areas, over 20 percent of filers use the EITC. Iowa’s Earned Income Tax Credit is an important tool in making work pay for low-income households. We have shown how a further expansion could better fill the gap between low-wage income and a basic-needs household budget, as well as improve Iowa’s tax treatment of low-wage families. Almost 3 in 5 single-parent families in Iowa fall short of the basic needs level of income despite working at least half time – and 29 percent earn less than half the break-even level. Working full time is no guarantee that your family will be able to get by. In fact, 1 in 6 Iowa households with a worker earned less than is needed to support a family at a very basic level. 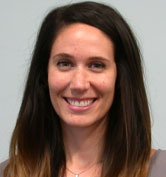 That is the finding of a report released Wednesday by the Iowa Policy Project. The new report, part 2 of the 2014 edition of The Cost of Living in Iowa, used census data to estimate how many families earned less than is needed to pay for a no-frills basic standard of living – covering rent, food, transportation, child care, clothing and health care. In all, at least 100,000 Iowa families earn less than the basic needs budget amount (reported in part 1 of the Cost of Living report). For those families, the average shortfall – the break-even income amount minus what they actually earned – was over $14,000. So how would an increase in the minimum wage help such a family? 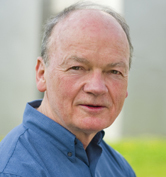 A full-time wage earner at the current minimum wage of $7.25 would see an increase of almost $6,000 in annual income if the wage were raised to $10.10, as Senator Harkin and others have proposed. 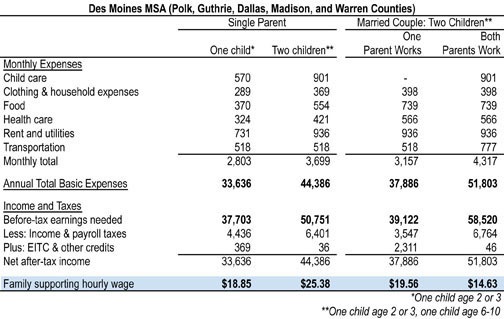 That’s a pretty good chunk of the average $14,000 shortfall facing these families. 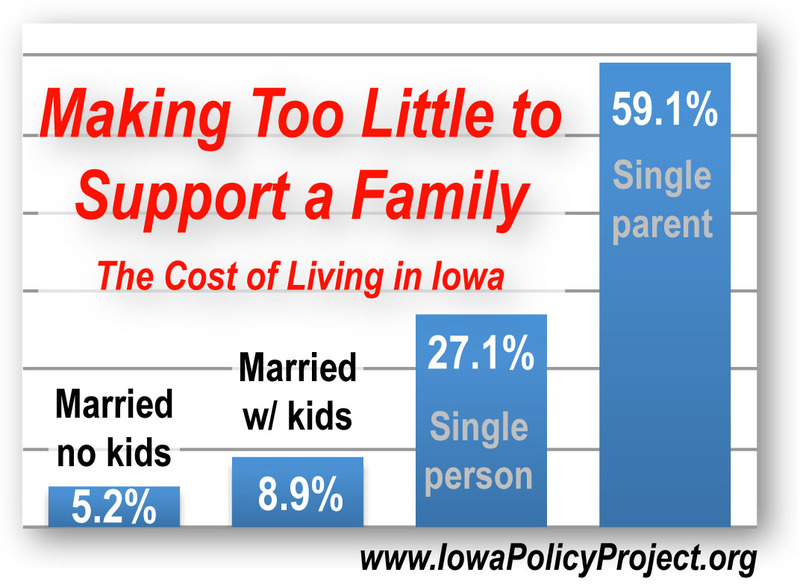 The situation facing Iowa’s single-parent families is much bleaker. Almost 3 in 5 – over 27,000 families – fall short of the basic needs level of income despite working at least half time, and 29 percent earn less than half the break-even level. The average working single parent’s earnings fall over $21,000 short of what is needed. High child care costs are responsible for much of that shortfall. How do such families get by? Some move in with relatives or find short-term strategies to survive, but many rely on work supports such as food assistance, hawk-i or Medicaid or the Affordable Care Act subsidies for health care, and the state’s Child Care Assistance program. Wouldn’t it be better for everyone if Iowa’s low-wage employers followed the lead of Costco and others and quit using these public supports to subsidize their low wages? An increase in the minimum wage makes all employers responsible for providing something closer to what is needed for a worker to get by in today’s world. Even a single person living alone needs in excess of $13 an hour to pay the bills. We need to strengthen our work supports in Iowa as well. Child Care Assistance in particular needs to be reformed. We have one of the lowest eligibility ceilings in the country: At an income well below what any family needs to get by, assistance is eliminated. And we make it difficult for the thousands of students who are parents to work part time while going to school part time to qualify for child care assistance at all. Still, employers need to do their part to make work pay. Working full time shouldn’t leave a family in poverty. When the costs of insurance keep rising, that makes it tougher on the household budget — or results in people not having insurance. The Cedar Rapids Gazette today offered an interesting look at the question of where Iowans get their insurance. It’s less and less something that comes through employment. And when the costs of insurance keep rising, that makes it tougher on the household budget — or results in people not having insurance. This is a trend we’ve been watching and reporting on at the Iowa Policy Project for many years, as have several good research organizations such as the Economic Policy Institute. The Affordable Care Act offers at least a partial remedy. As health insurance exchanges are developed, affordable insurance should be more readily available. Tax credits for employers providing insurance will provide a targeted incentive to offer employees a better option than what employees might find on the individual insurance market. These losses reflect two overlapping trends. The first of these is costs. Health spending has slowed in recent years, but still runs well ahead of general inflation. Both premium costs … and the employee’s share of premiums have risen sharply — especially for family coverage — while wages have stagnated. In 1999, a full-time median-wage worker in Iowa needed to work for about 10 weeks in order to pay an annual family premium; by 2011, this had swollen to nearly 25 weeks. Steep cost increases have pressed employers to drop or cut back coverage, or employees to decline it when offered. High costs may also encourage more employees to elect single coverage — counting on spousal coverage from another source and kids’ coverage through public programs. The second factor here is the shift in sectoral employment outlined above: Job losses are heaviest in sectors that have historically offered group health coverage; and job gains (or projected job gains) are strongest in sectors that don’t offer coverage. 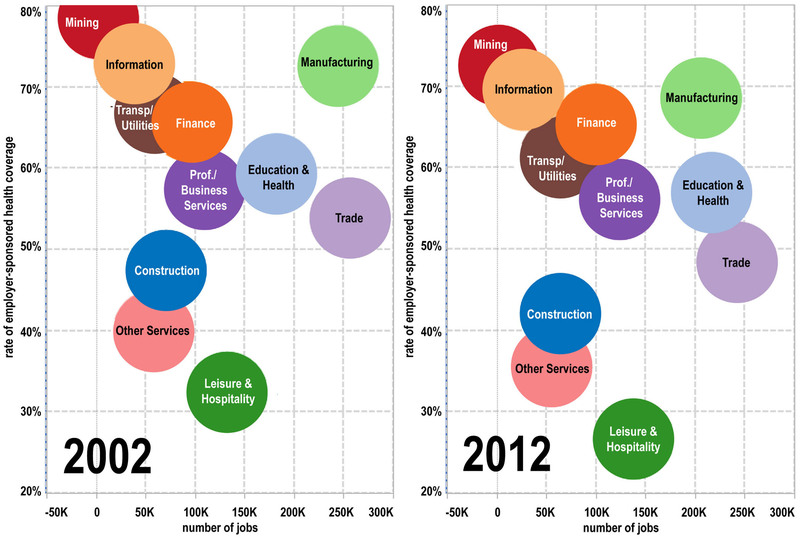 This graph looks at the rate of employer-sponsored coverage, by industry sector, from 2002 to 2012. An interactive version of that graph in the online report allows the reader to toggle between those two years; the colored balloons sink on the graph in moving from 2002 to 2012, as if they all are losing air — the result of declining rates of coverage. Good public policy could help to fill them again. While passage of an increase is uncertain, Iowans working at the minimum wage will have to get by with creativity, possibly working two jobs and needing work supports. Dialogue about increasing the minimum wage is finally emerging in 2013. President Obama proposed an increase in the minimum wage to $9.00 per hour in his State of the Union address, and Senator Tom Harkin and Representative George Miller have introduced the Fair Minimum Wage Act of 2013 — which would raise the minimum wage from $7.25 an hour to $10.10. The Harkin-Miller bill would raise the wage in three steps of 95 cents before indexing it to keep up with the rising cost of living. Iowa’s minimum wage now matches the federal. Raising it to $10.10 per hour would put nearly $6,000 more dollars in the pockets of Iowa families, and for the first time since the late 1970s a single parent with two children would be above the federal poverty level — a wage gap that we should have seen diminishing over time, but have not. Recognizing that the federal minimum wage is too low, 19 other states, including the District of Columbia have a higher minimum wage than the federal and 10 states annually increase their minimum to keep up with the rising cost of living. Unfortunately, attempts to raise the federal minimum wage and set automatic adjustments to keep pace with the rising cost of living have been hindered by bad economics. Beliefs that increasing the minimum wage will lead to job loss, that the majority of those benefiting would be teenagers and that it would decrease output for certain industries is the consensus among opponents, however unfounded. A recent report from the Center on Economic Policy and Research (CEPR) looked at the most influential research done on the minimum wage in the last 20 years and continuously found insignificant or no discernible effects feared — and promoted — by opponents of raises in the minimum wage. While the passage of any of these proposals remains uncertain, Iowans working for the minimum wage will have to get by with their creativity; possibly working two jobs, relying on cash assistance and tax credits, going without those amenities that make life a little more enjoyable and hoping that one day they might join the middle class.